My recent trip to Thimphu and Paro in Bhutan was a mesmerizing experience. So I thought I must come up with a post to tell our readers about this tour. Before my trip to Bhutan, I had no idea about this place, except, that it is still ruled by a king and that it the ‘Happiest Place on Earth‘. But when I got there, I realized that Bhutan is much more than just the happiest kingdom. It’s much more than that. My little discoveries about this place, during my short trip of 6 days made me fall in love with this place. By reading this post you will get to know why you should consider Bhutan as your next travel destination. When I was planning my trip to Bhutan, this New Year (2018), I was told by many of my friends that it was not the right time to visit the kingdom due to the heavy fog that shrouds the roadways. Even though this made me a little reluctant about traveling at this time, I did not want to kill the excitement inside me about my upcoming trip. So, I booked my tickets on the 3rd of January and headed towards the mysterious land. I did not have to carry my passport, nor did I have to apply for a visa because I was traveling from India. Being a friendly neighboring country, both the Indian and Bhutanese governments have exempted their people from carrying any of these travel documents on their visit to each other’s countries. Other than their own languages, the Bhutanese speak broken English and Hindi. You might also meet people you speak and understand Bengali. Fun Fact: Bhutan loves Bollywood. You will hear many familiar Bollywood songs playing in cabs, cafes, and restaurants. You might also see people gathering around TVs in public places to have a glimpse of their favorite Bollywood actor. Other than Bollywood, they also listen to popular English songs. The Bhutan king apparently is a big football fan. The general public is also very fond of this game and admires popular football player David Beckham. October to December is the ideal time to visit Bhutan. If you want to play in the snow, January end of February end is the best time for you. Winters are mostly very cold and windy here. Springs are mostly dry and pleasant. Even though you can travel to Bhutan from India without a passport, you will have to carry two things with you to be able to enter the country. Bhutan can be reached either by road or by flight. If you are traveling from India, it is easier to hit the road to reach Bhutan. If you are not a fan of road trips, then flying to the Paro airport can be an alternative for you. I did not want to take a flight to Bhutan for obvious reasons. 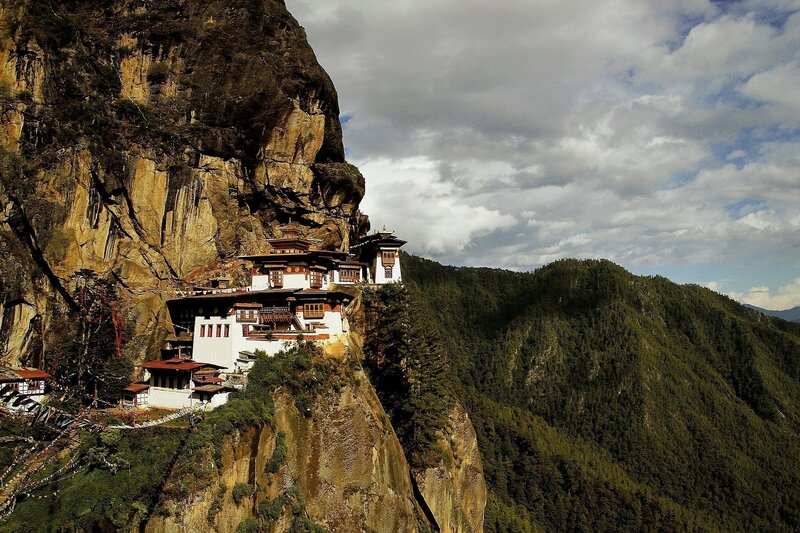 Bhutan is known to be one of the world’s most dangerous airports. I know that sounds uncool, but I was really petrified when I learned that it is so dangerous that there are only 8 licensed pilots in the world who are authorized to land at the Paro airport. For many of you, it might sound like a great adventure to fly to one of the most dangerous airports. But to me landing at an airport that is located amidst towering mountain peaks of 18000 ft height and is at an altitude of 1.5 miles above the sea level, did not sound like a great idea. Even the runway is one of the world’s shortest runways. Because the Paro valleys always experience strong winds blowing at high speed, almost all flights face severe turbulence at the time of landing. Now that you know so much about it, it won’t sound strange if I tell you that you might not have frequent flights from your place to the Paro airport. So plan your travel well ahead and book your tickets in advance. If you want to travel by road, you will first have to reach to Jaigaon( the Indo-Bhutan border on the Indian side) and then take a cab from Phuetsholing(the Indo-Bhutan border on the Bhutanese side) after completing the immigration procedure. To reach Jaigaon, you will first have to reach Hasimara, a small railway station which is about 14 km from Jaigaon. If you are traveling from other parts of India besides Northeast, check out how to reach Hasimara from your place. If you are traveling from Northeast India, Hasimara is about 7 hours from Guwahati Railway station. You will easily get sharing public vehicles (25 INR per person) or private taxis(generally 400-500 per cab but rates might vary for tourists. So, use your negotiation skills well here) to drop you at the border. Once you reach Jalgaon, just cross the Indian border gate to reach the other side. You can directly go to the Bhutan immigration office where you can get your documents checked. This does not take too long, and you can easily get it done in 20-25 minutes time. The officials break away for lunch from 1-2 o clock. So, try reaching there before 1. The office does not check documents after 5. So, this is another thing you need to remember. Money Saving Tips: Do not be manipulated by brokers who might approach you to get your documents checked quickly. They will charge you for their services and promise you to get it done without standing in the queue. There is no need for any assistance. The process is any way simple and quick. You can do it all by yourself. You might want to go around and explore Phuetsholing a bit. But there is not much to see here. So I directly headed to Thimphu. Thimphu is about 6 hours from Phuetsholing. Although Thimphu is only about 179 km ahead of Phuetsholing, it takes some time before you reach your destination because of the curvy road. Side Tip: Do not be misled by the Google drive time that might show you 4 hours and 30 minutes time to reach your destination. You can hire a cab on spot from Phuetsholing. Some of them might charge you an exorbitant price, but at this point too, try using your negotiation skills. Cab drivers might charge you 3000-4500 INR one way. The rates will also depend on the vehicle that you hire. Small cars might charge you slightly less, but the 6-7 seaters obviously will quote you a higher fare. Since I was traveling in a group of 5 we hired a 6-seater car. The cab driver at first quoted an amount of 3500 INR, but we managed to get him down to 2700 INR. Side Tip: Get yourself a Bhutan tourist sim card at Phuetsholing itself. These cards will cost you 180 INR (120 talk time with no data) and are valid for a month. You will have to submit a photocopy of your immigration documents to get the tourist sim. If you are traveling from India, you do not have to convert your currency. Bhutanese accepts and offers Indian currencies at every place. However, I would like to advise you not to carry the 2000 INR currency as this note might not be valid in Bhutan (not sure about it). I mostly carried currencies worth 500 and below which I could easily use during my stay there. People traveling from countries outside India can convert your currencies either to Indian or the Bhutanese currency. BHUTAN SAFE FOR SOLO GIRL TRAVELER? 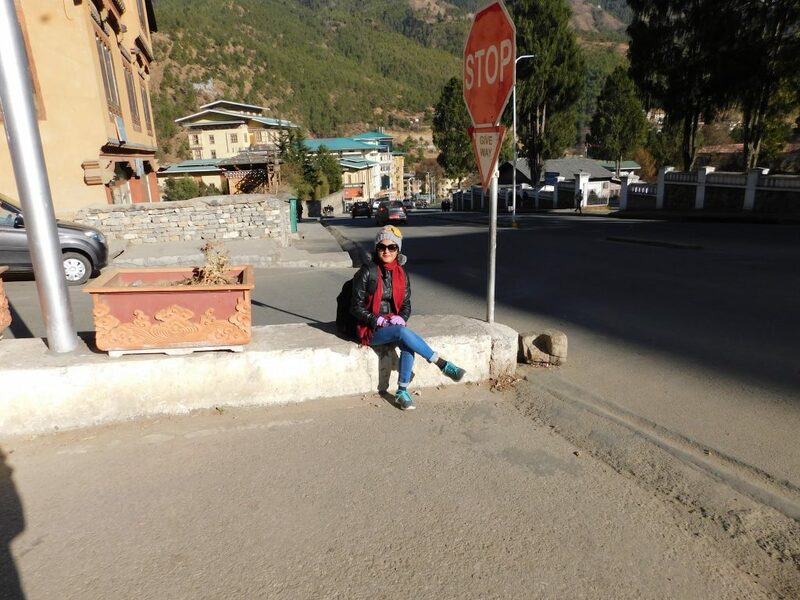 If you are a girl traveling alone to Bhutan, you will not face any kind of threat from people out there. Bhutan according to me is one of the safest places you can be. It has lovely and warm people everywhere who are ready to help you anytime you need help. The only problem for solo travellers is that you might have to provide an undertaking to the Bhutan government that you are traveling alone and that you are responsible for any risk that might come up during a trek. Bhutan is a place that is surrounded by extremely high mountain peaks and tourist love the idea of trekking in the mountains during their stay out there. While some easily complete these adventure trips, some return midway for several reasons like fatigue, difficulty in breathing etc. It is therefore advised that you travel in a group or at least one person to accompany you throughout your travel. So basically, other than the geography of the country, nothing in Bhutan is unsafe. Travelling in Bhutan is an extraordinary awesome experience; the clean & green country teaches you how to be happy in small things, and that to be grateful for all that you have. I am sure, my Bhutan travel guide will help you plan a perfect holiday in this happy country with yourself, and that you will be able to keep yourself away from all the hassles. If you face or have any question, feel absolutely free to write in below comment, I read all the comments and reply accordingly. Dear readers, I hope the blog post answered some of the questions about your Bhutan trip. Do you still have a question? Feel free to comment or rate us by clicking the 5 stars.